Sister John Berchmans Conway, Karachi Convent of Jesus and Mary principal and ex-principal Lahore CJM, is being conferred Sitara Quaid-e-Azam for her services towards education and promoting interfaith harmony in Pakistan. President Asif Ali Zardari approved conferment of Sitara Quaid-e-Azam on her after it was recommended by Sindh Governor Dr Ishratul Ibad and was endorsed by Prime Minister Yousaf Raza Gillani. She has spent 59 years teaching young girls of all faiths from different parts of Pakistan. Under her able leadership, the institution has been providing quality education to Pakistani girls. “I still remember her smile when she welcomed me to CJM Lahore in 1992. That smile has lighted up many lives all these years,” said an ex-Conventarian. “Sister Conway has touched the lives of countless Pakistani schoolgirls as a mentor, counsellor, friend and teacher. Her constant adherence to the call of duty has made her a living example to emulate,” the citation forwarded to the president for conferment of Sitara Quaid-e-Azam read. I joined CJM, Lahore in 1976 and she took my interview for Prep. I was in school for 10 years, she left and came back again. The school was the best under her administration and also Sister Maria Cecil(spellings I am not sure of). I miss my school days a lot. I wish there was a proper website where the old students could join. Very proud to be a student of Sister Berchmans. One good thing which the president has done. Thank you so very much for all the beautiful words =truely so true. Extremists??? The amount of charitable work this great lady has done …. Anyone with a brain as size of a peanut can bugger off!!!! Wake up it’s 2012!!!!! Sister Berchman’s character building classes are her legacy that will always shape the lives of her students! I have had the opportunity to work at CJM while she was Prinicpal, a truly inspiring and motivating personality. I have been her student for 8 years and I highly respect her for the person she was and taught us to be. P.S don't forget to mention her services in CJM Murree where she was the principle for many years. She was well deserved of this award and thanked to president Asif Zardary for recognizing her services for the uplifting the education among girls the Pakistan. I am so happy that daughter is also one of the student in Lahore CJM. And What We All Conventarians Love To Cheer At Such Occasions…Hip Hip Horrayyy!! yaay!! sister berchmans was the BEST principal/teacher/mother ever!! CONGRATULATIONS! we love you sister! She was no doubt the best teacher n a mother for us,,,,,,,,,,,,,,,,,,,,,the love she gave us is unforgettable ,i was lucky to be her student i love u sister n miss u alot! wooh….i feel proud 2 hv been taught by u sister v LLLllluuuUUUvvVVV you… congratulations…!!!!!! Congrats you deserve this , love you, the only thing is a thug like zardari shouldnt honour a great person like u maybe someone better should confer this on you. Honoured to have been part of cjm for 13 years and now my daughter is under the guidance of Sister Berchmans. Many congratulations! Way to go CJM! I love her along side my grandmother for teaching me the beauty of values and love and care towards all. She always said something positive to each of us and had it not been for her, Id still be failing math:) Theres no words to describe what i feel for her but Im so thankful her light has touched me too. Am so proud to be her convertarian. She will always be the face of good for me. Definitely well deserved. I still remember the day I first met Mother Berchmans when I got my admission in '89. It was the beginning of a wonderful journey that I will remember for the rest of my life. Thank you for all that you have done for us. We are all eternally grateful for your services! Congratulations and God bless you! Was she there when you girls were there? I remember that one morning when I was 9 she held my hand and said to my mother, "You can get her her tuck now". It was the day I can never forget. Thank you Sister Berchmans for making me a part of the Convent School and for all that you taught me. Today, here I am in Canada, when every second person asks me how did you learn to speak English in Pakistan? Thanks to you Sister. What I am today, I am proud to be, that's because of you Sister. You really deserve it. Congratulations and God Bless You! Congrats Sister. Keep up the good work you are doing. God bless you. It's really nice to see Sr Berchmans being appreciated for her hard work. She was always respected as a principal at Lahore CJM. Its an honour for me to have worked under you .I still remember that crisp morning of October 1985 when you had called me for an interview at Baby school and offered me my first ever job in your prestigious institute. Today whatever i am is because of CJM. Proud to have Mother Berthmans signature on my report cards at the Convent of Jesus and Mary, Karachi way back in KG School! Congratulations to Sister Berchmans. Absolutely delighted to read this. May she be honored many times over for giving so many years of her life to educating pakistani girls. It amazes me how someone like her can spend so much of her life in a country like pakistan and here so many of us are always looking for a way out. Just simply Love her, she is the best thing I remember from the Convent days. She was always there to boost my confidence, push me in the right direction and inspire me to work!!! 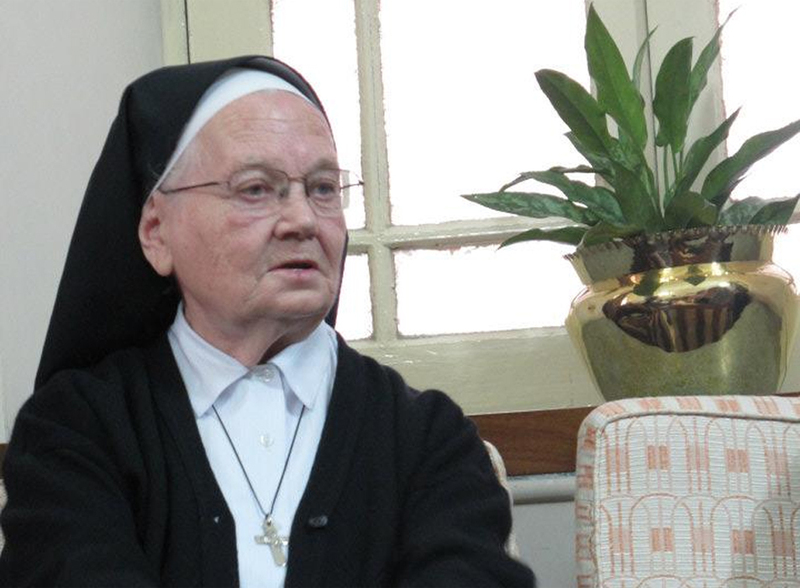 Sister Berchmens was also a principal at CJM Murree…!! I was a teacher there at that time… proud to be a student of CJM Murree as well as a teacher for a short while.. Congratulations St. Berchmnens!! Sister … May God Bless you without your dedication to my education I could not have graduated from Harvard University! I am so proud to have been your student! congratulations. u deserved it for your dedication in the field of education, u inculcated discipline, values and taught lessons of character building among millions of young girls of Pakistan. May god bless u and grant u long healthy life.You guided me twice once as a student in cjm Lahore then as a teacher in cjm,Murree..i learnt a lot from u sister, proud to be from CJM. She taught us maths when we were short of a teacher… after about 17-18 years i still remember exactly what she taught. On my last day of school she told me that wherever i go CJM will be a part of me and every brick of CJM would have a bit of me in it…. amazingly i met her after about 5 years from that day at a book shop and she immediately called out to me by name and said "you were the one who was good in maths"…. that was such a shock… she deserves a lot more, but thank God for at least this. God bless you Sister Berchmans. Its a great honour for all the Maryians … as a Student of CJM , Lahore ……….We all love u Sister Berchman…………………………………..CONGRATULATIONS !!!! we are proud to be a conventarian and very proud of Sister – she is a wonderful. Many many congratulations. She realy deserved more than it Being a parent we had a meeting with her regarding the admission of my son Huzaif Mushtaq we found her very kind and softspoken . She is a great lady and a role model for teachers and an ideal for those who work hard with sincerity for the betterment of new generation. I personally appreciate and salute her for her devotion. I surely congratulate her for all her accomplishments. However, I think sister should know that hitting young children is a sin in any regilious. A stick or a drum stick is not to be used on a child and neither should a hand. It is a true sin to hit a person, specially a child who cannot respond or defend him/her self. Congratulations Sister Berchmans!YOU deserve more than this.I am highly grateful to the government of Karachi for bring Her great services in notice and giving her appreciation.I can never forget what she has done for me.Principal CJM Murree was a mother to all the girls who stayed away from their family under the most protective, caring and legendary woman.She is an Angel on earth ,her smile is the sunshine to the girls of Pakistan.We love you sister. i have never seen such an inspirational teacher as sister Burchmans I owe alot to her, to begin with I would hvae never known anything about Mths had it not been for her. Wonderful lady ! Has always stayed on ones mind. Proud to be a conventarian. God bless u!proud to b a conventarian! congratulations Mother Berchmans, a well deserved honour still remember the wonderful days I spent at CJM Lahore. I worked as a teacher under her inspirational guidance. I owe much for my successes. God Bless her and all the Sisters.